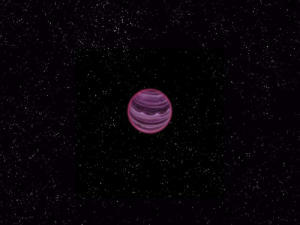 A planet has been discovered floating free in space, not attatched to a star. This is the first discovered with this distinction. Over the last few years, quite close to 1000 planets have been found orbiting other stars besides our sun. Which is really cool. That was to be expected, stars form in nebulous clouds of gas and dust, just as our sun did. It also stands to reason that most stars, would have planetary systems as we do. The investigation in the matter proves conclusively that this is so. Science for the win! It has also been suggested that during the planet forming stage, or just after, when the orbits are being worked out, that the possibility exists that a fledgling planet could be flung out into space. Again scientific investigation, lends credence to the idea. This looks like a smoking gun to me. Moral of the story, science is working diligently every day to test new ideas. When these ideas are confirmed, it is cause for a moment of celebration. Then when that moment passes, new questions arise, which need looking into, and that is why science is awesome! There is no end to inquiry, there are standards to be met, there is no room for bias or preconceptions, there is a never ending investigation into the why and the how, it is this desire to learn that makes an (yep, I’m gonna do it) Evidence Based Reality the king of the school of thought. This entry was tagged Astronomy, New Discoveries, Science. Bookmark the permalink.